Best. Dogs. Ever. | Separated by a common language. If only my house weren’t strewn with shoes and a laptop cable, this would have been the perfect shot! BLAST!!! I am thinking of just photoshopping outer space behind them. 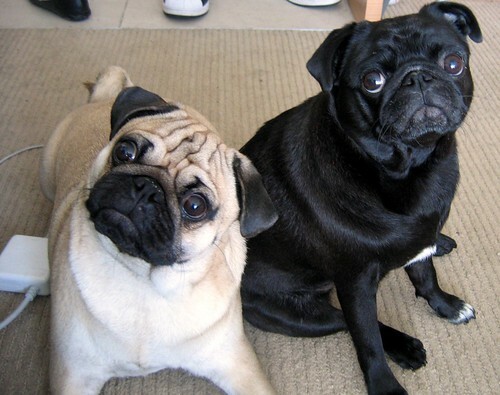 Any requests for what you’d like me to photoshop these two puggies in front of? And yes, I know I haven’t posted in forever, but it was my birthday and I got another tattoo and so many stories that I need to write about! I shall update more often now that the chaos is over! I vote for a volcano showering marshmallow magma. That’s one pyroclastic flow i’d like to be caught in. You can just extend the carpet in Photoshop to cover the shoes! Those are some fine looking dogs indeed.